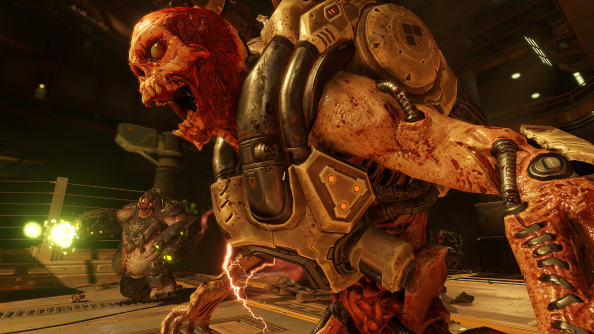 Doom’s multiplayer has been in beta all weekend – open to players who, in ancient times, pre-ordered The New Order. 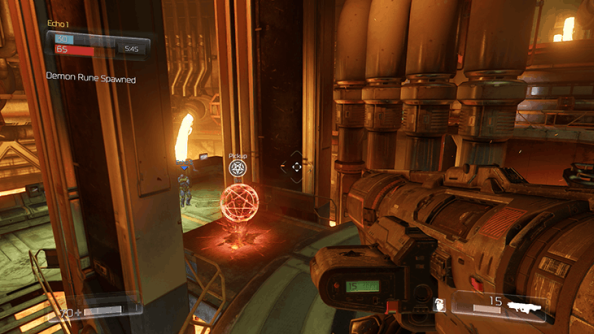 There’s not much familiar from MachineGames’ shrewd Wolfenstein update in Doom’s taut team deathmatch, though: where id once modelled the lighting that revealed the path ahead for the FPS genre, they’re now knowingly indulging in throwback. Will you be into its peculiar mix of reverence and revenants? Let’s try and work it out. Does it feel like Doom? Depends which bit of Doom you’re bothered about, frankly. If you’re one for twisty, devious Doom level design, that’s something only single-player can supply. But if you’re somebody who drilled a hole in a dorm wall to play some of the earliest ever deathmatch, well, there’s lots to recognise here. In particular, id have talked up the speed of their nostalgic shooter. And a minute with the beta reveals that yes, it’s certainly fast. But not as fast. Furthermore, the Super Shotgun has the correct boom, but not the crunch. Yeah. 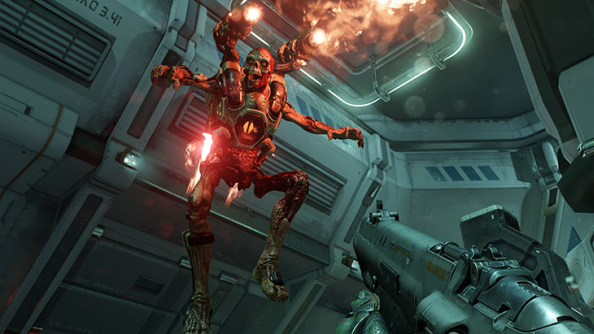 Thing is, so much of id’s hard sell has been predicated on the idea of recapturing the sights and sensations of the original Doom – in apparent reaction to a cancelled Doom 4 that fell too far from the tree – that it’s tough not to judge the game on those terms. And in the movement department, concessions have been made to contemporary shooting. Where Doom the First strapped you into roller skates, nu-Doom sticks the player camera atop the modern-day Christmas present equivalent – a hoverboard. It’s missing the momentum that carried you around corners and over chasms in 1994. About that – Doom didn’t have a jump key. How does that work now? Even without a Y axis, Doom always experimented with verticality, and it’s here that nu-Doom shines in its understanding of what made the early id games tick. Double-jump is a savvy addition – flexible enough that you can either hop up high or shoot for distance. Thanks to some vertiginous map design and the automated ability to mantle onto ledges, you’re able to traverse quickly between high points – and get out of the way in a fix. With no cover to speak of, the larger part of staying alive is dodging fire in plain sight. Given that, high-level play will surely involve mastering the double-jump evade. Back up a bit – I’m a big, bad marine with a gun. Why would I want to get out of the way? The power-ups are, without wishing to sound trite, exceedingly powerful. Success is only as much about your aim and mobility as it is passing through the right spot just as an icon respawns. They promise quad damage, heavy slugs courtesy of the Gauss Cannon and, if you’re fortunate enough to run into a rune, a furious few seconds as a demon. The Revenant is a particular case in point. So long as you don’t succumb to the temptation of the jetpack and make a target of yourself in more open environs, you’ve a license to tromp unchallenged through the corridors. On the receiving end, it often feels like you’re killed as soon as looked at, as if by a bald medusa wearing shoulder rockets. It works best in Warpath – a mode that has players chasing after a capture point that slinks along a map’s pathways like a sentient rug. There, the push and pull of power-ups can insert tension into a match even when one team has taken a clear lead. If a Revenant manages to cleave through any players holding down the capture point, that’s a few moments the opposing team can put to good use, wiggling their toes in the thick, translucent carpet of the objective. I saw some numbers pinging out of players’ heads on Twitch. Do I need to worry about that? The concern is understandable: enemies that bleed numbers tend to signify a debt to action RPGs. Which works wonderfully for Borderlands and The Division – but incremental increases in DPS have no place in Doom. There’s nothing to worry about here. Frankly, I’m not certain why the digits are necessary, though I have a theory – they’re there to give you a vague sense of how much health your opponent has left, and to give you a metrical thumbs-up whenever you manage a crit. Will anybody stick with it? That’s the question, isn’t it? This is unflabby, no-frills multiplayer, soundly built by a team with a wealth of company knowledge about this sort of thing. And yet it’s not totally convincing as a competitive environment: in conversation with our Ben, he posited that the dramatic swings of demon runes and power weapons on show in the beta simply wouldn’t allow for pro-level play. Maybe that isn’t what id want, though: in 2016, serious competitive shooters (with the exception of CS:GO) are released as free clients and updated over the course of half a decade. Perhaps Bethesda will be happy if they can sell a few map packs and keep Doom from being hurled back into the abyss – here a melodramatic characterisation of the pre-owned shelf at HMV. Beyond that, Doom’s multiplayer might just be robust and respectable enough to retain a small, dedicated community. And in a world where the player numbers of even Titanfall and Evolve drop off sharply, it’s a rare FPS that can summon a decent game through matchmaking a year down the line.